I met him at a Minor League Clearwater Phillies game at Jack Russell Memorial Stadium in Clearwater, Florida in 1996. 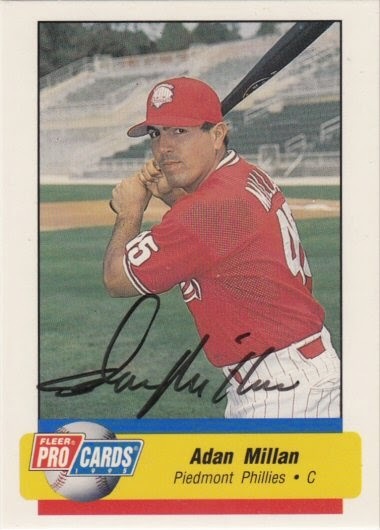 Adan signed a 1995 Fleer Pro Cards card #190. The memory still gives me chills when I watched him get beaned in the face while batting for the Clearwater Phillies. I remember clearly yelling to the batboy Jason Brummer to run to the clubhouse to get some ice. He instead decided to give the umpires more baseballs. I remember running from the stands to the clubhouse to get ice. The ice still never made it to him. An ambulance drove onto the field and took him away. Luckily he turned out ok. A short while later, he was still on the DL recovering from the eye injury from the pitch, we traveled with the team to play the Tampa Yankees. Right around the start of the game. He and I walked along side Dale Mabry Highway and he bought me dinner at a local diner.